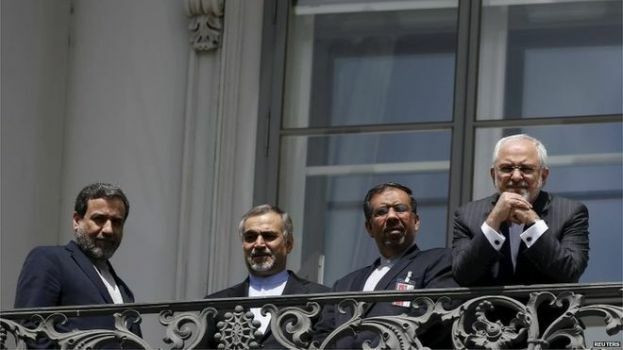 Iran’s foreign minister has accused world powers of making it harder to reach agreement at nuclear talks in Vienna by taking different positions. Mohammad Javad Zarif said “several countries” were also making “excessive demands”. His UK counterpart said the process was proving “painfully slow”. The so-called P5+1 – US, UK, Russia, France, China and Germany – said talks would go on until at least Monday. The powers suspect Iran of seeking nuclear weapons, which Iran denies. Iran says its nuclear programme is for purely peaceful purposes. The sides have been holding marathon negotiations to reach a long-term agreement and have missed successive self-imposed deadlines. Both Mr Zarif and US Secretary of State John Kerry said though that they would not be rushed into making a deal. “We’re here because we believe we are making real progress,” John Kerry told reporters on Thursday. But he cautioned that “we are not going to sit at the negotiating table forever” and that he was prepared to “call an end” to nuclear talks with Iran if “tough decisions” are not made."